Who knew that a great boat for the Pacific Northwest and southeast Alaska would come from Orlando, Florida in the Regal 42 Fly ? Many years ago, a group of us—all serious boaters and fishermen—were in a pub on the west coast of Vancouver Island celebrating a good day on the water. One of my buddies had caught a 38-pound salmon. In those days we called it a “smiley,” named from the fisherman’s expression after landing it. I had caught a 196-pound halibut and it looked like a sheet of plywood as it emerged from the depths; its cheeks weighed almost two pounds! My buddy and I were the high liners of the day and as such, bought the beer. Both of us took that responsibility seriously, so beer flowed freely. Soon we started to discuss and sketch on napkins the “perfect” boat for the west coast. It had to be no more than 42-feet long since that was the maximum length the marine railways in the smaller communities up and down the coast could haul; this was in the days before the widespread use of Travelifts. It should have two staterooms, two heads, great visibility, and an open layout. A good-sized command bridge was on the list, as was the ability to move quickly onto the back deck from inside when fishing. We all believed in being warm and dry until the reels started screaming. 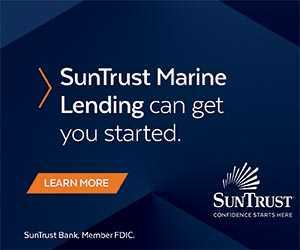 The vessel had to be able to operate efficiently at speeds in the five-knot range as it poked around in the reefs and rock piles tracking fish. As we called it a night in order to take advantage of the good fishing at 4:30 AM the next day, one of the guys said, “It would be nice to have a boat like that and also be able to cruise along at 20 knots.” We all laughed and said, “Yeah, like that’ll ever happen!” Years later, that dream is now a reality with the Regal 42 Fly. Regal Marine Industries was founded in 1969 by the husband and wife team of Paul and Carol Kuck. After the founders passed away in 2005 and 2006, the company continued as a family business with the Kuck’s three children in charge of the operation. 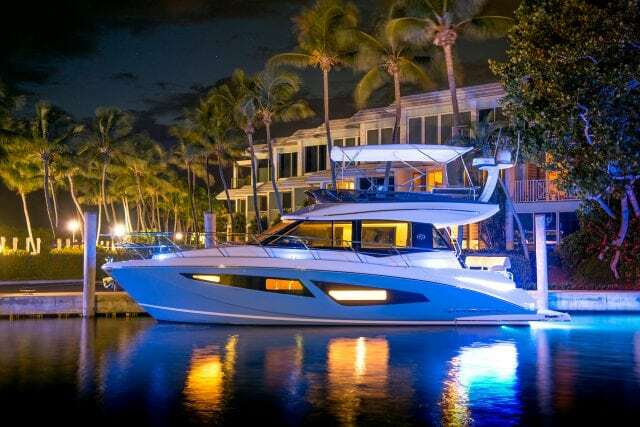 Regal is among the 10 largest recreational boat builders in the U.S., has 120 dealers across the country and ships boats to 40 other countries. In selecting dealers, Regal has attempted to ensure those dealers have the same commitment to customer service the builder has; Regal has won a number of J.D. Power Awards for exceptional customer service. In fact, as I wrote this article, telephone contact with Regal was always quick and easy, and my questions were answered fully and promptly. For anyone about to spend a substantial amount of money on a new vessel, company responsiveness is an important factor to be considered. 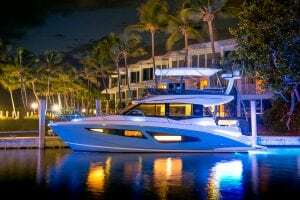 The Regal 42 Fly is a brand-new vessel in their lineup. 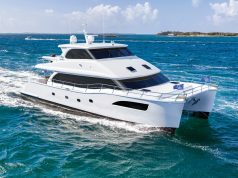 Its thoroughly crisp, modern design, complete with expansive hull windows and large flybridge, is not drawn at the expense of practicality. The cabin roof extends well aft to protect the cockpit in rainy weather known to occur in the Pacific Northwest and makes fishing in the rain tolerable. Conversely, it provides protection from the blazing sun in the south. 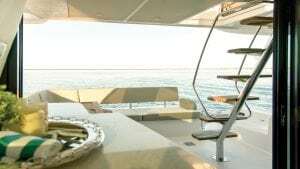 It also means that with the aft deckhouse doors fully open, those on board can move seamlessly from inside to outside. The galley is located at the aft of the deckhouse so that meal preparation is convenient whether dining is to be inside or alfresco on the back deck. The interior spaces in this new Regal 42 Fly are made for real people. The two beautifully appointed staterooms have plenty of space for a slightly “husky,” average height 200-pounder like myself to move around. Many 50 footers don’t provide the same space. The heads and shower were also comfortably sized.Throughout the vessel the fit and finish is superb, and all equipment is top of the line. 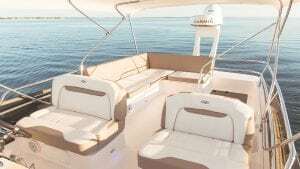 In fact, the sound/entertainment system, electronics, engines and pod drives are the same make as is found on much larger yachts as are the seagrass mats, which are soft underfoot, stain resistant and rot proof. 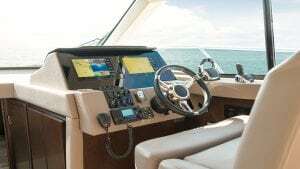 The new Regal 42 Fly benefits from designers who built in copious storage space, including forward deck lockers that accommodate bumpers and lines, a covered anchor winch with fixed snubber cleats, aft deck lockers for almost anything, and space under cockpit seating for life jackets and other items. 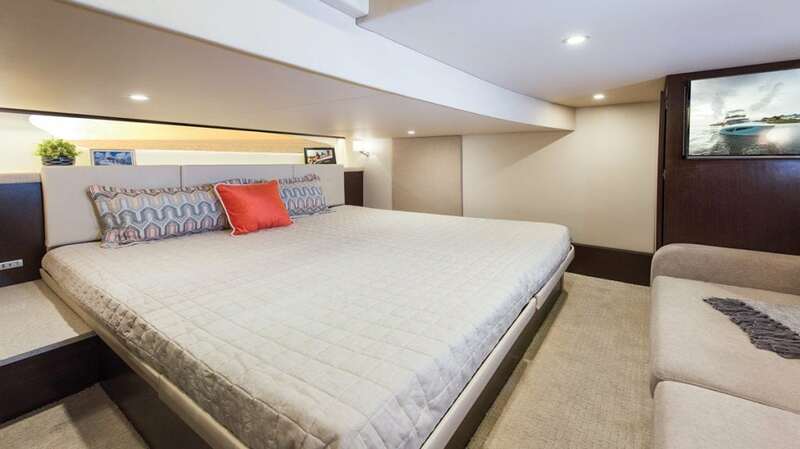 Each of the staterooms has plenty of storage; the aft features twin beds that can be converted to a single king. It also features a cedar-lined armoire with drawer storage under. Even the upholstered headboards have storage built in, and the dinette settee has built-in storage below. 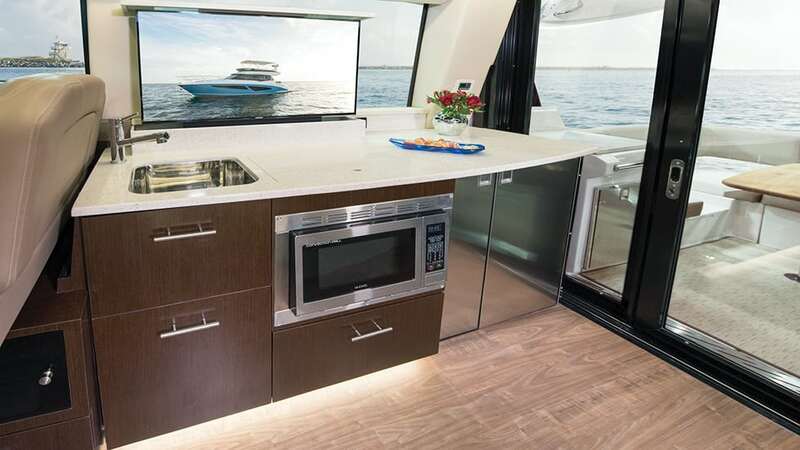 The galley features easily cleaned, solid countertops, a stainless sink, convection oven, and drawer-style refrigerator and freezer. With staff from Seattle’s Alexander Marine on board and at the helm, we fired up the twin, brand-new Volvo D6, 6-cylinder, 435-hp engines. They fired up instantly without smoking, hunting or clattering. The computer-controlled, common rail injector system worked perfectly. These engines weigh in at about 1,450 pounds each, and both the block and heads are cast iron, assuring long life if serviced normally. Using the joystick control we easily moved through the crowded docking area and into the fairway. The control system was very precise, something important in even more crowded marinas. During our sea trial, two things stood out; the first was expected. This new Regal 42 Fly responded precisely and smartly to the helm at any speed even when moving dead slow, something that is not always the case with many boats. The second thing was the relative quiet of the boat even at the wide open throttle. I always bring my own noise meter on sea trials, since it is the same one used by Occupational Health and Safety officers worldwide, so I know it works properly. At 6.2 knots, the noise meter registered 66 dB; a normal conversation is 70. But even at higher speeds, my meter did not show more noise, which was astounding. I learned that the 42 Fly hull was solid fiberglass topped by a cored deck, with resin applied by the infusion process, which produces a relatively lightweight but very strong, hull. 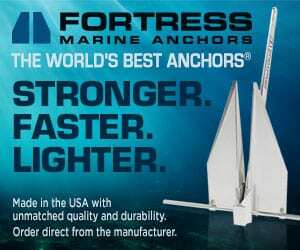 The downside of lightweight hulls is typically more noise since there is less mass to absorb vibration and pounding. Regal’s engineering department disclosed that they include sound-deadening material in the hull laminate, which resulted in the very quiet ride I experienced. Furthermore, this boat was equipped with trim tabs and a stabilizer system, neither of which was engaged during our sea trial, yet the ride was very comfortable. 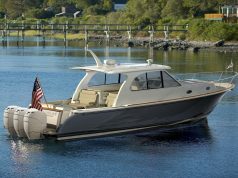 The new Regal 42 Fly is an excellent vessel from a builder that has offered well-respected boats for almost half a century. The vessel handles very well and is equally at home poking around the local reefs and rock piles while fishing or running at high speed to escape a storm front. When tracking fish at low speeds, the twin Volvos sip fuel, getting 3.6 miles per gallon. 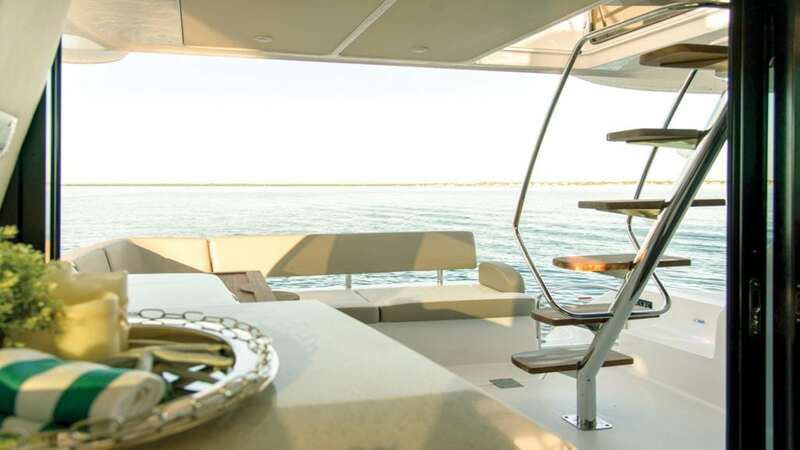 Visibility is excellent all around and truly spectacular from the flybridge. It’s one of those rare boats that is designed and built for fishing, cruising and entertaining—a true triple threat. This new Regal is so full of features a single sea trial cannot do it justice and should be on prospective boat buyers’ “must-see” list.